﻿ FRENCH OPEN 2018 QF – Danish dynamite! Denmark identified another of its promising athletes that might come and disturb the world order, as Rasmus Gemke reached his first ‘Superseries’ semi-final, exhibiting his very delighting game throughout the tournament, while two more Europeans, the Stoeva Sisters, defeated the reigning Olympic champions to enter the final four in Paris. Denmark found another promising player to take on the world circuit, in the name of Rasmus Gemke (pictured top). The Danish youngster recently grabbed the Spain Masters title to add to his Bitburger Open win of last year but he continues to show great signs of improvement as he just joined the semi-final of the French Open Super 750, marking his first weekend appearance in a ‘post-Superseries’ event. The twenty-one year-old faced Thailand’s Kantaphon Wangcharoen in the quarter-finals, a day after his long fight against team-mate Hans-Kristian Vittinghus, which lasted an hour and a half. Despite the obvious tiredness, he managed to again fight hard, against a Thai opponent who was had no intention of letting it go easily. Losing out the first game 12-21, the Dane gathered his remaining forces to steal the other games 21-11 and 21-17. 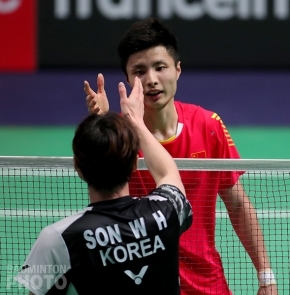 He is now scheduled to face the world #2, Shi Yuqi (pictured above), who easily disposed of Korea’s Son Wan Ho. “It’s going be fun to play such a world class player. He’s world number two so of course it’s going to be a good experience for me,” concluded the Dane. Bulgarian sisters Gabriela and Stefani Stoeva (pictured) achieved the greatest upset of the day, with their fantastic win over the reigning Olympic Champions Misaki Matsutomo and Asaya Takahashi. The world #11 always seemed in control during the whole match. The Japanese duo were severely pushed, with long rallies and a steady defence from the Stoeva sisters. 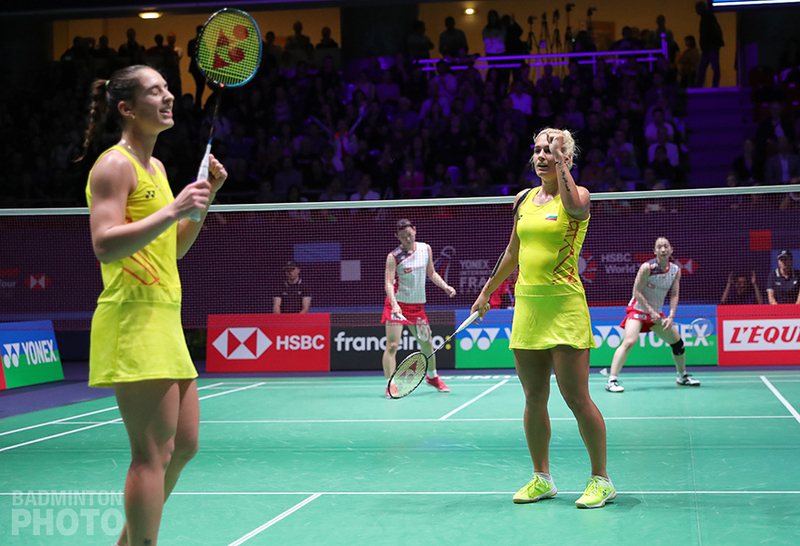 After sweeping away the Olympics champions in straight games 21-8, 21-16, they will now try to repeat the same achievement against Korea’s Shin Seung Chan and Lee So Hee, last year’s runners-up at the French Open. Indonesian legend Liliyana Natsir bid farewell to the French Open today as she and her partner Tontowi Ahmad (pictured) came close to beating the constantly rising Japanese pair of Yuta Watanabe and Arisa Higashino. Although Ahmad and Natsir came to Paris with status as title holders, the Olympic champions had to concede the match after just over an hour, as the speedy Japanese pair took it 21-16, 16-21, 21-18. Liliyana Natsir, who has already announced she will be retiring by 2019, is slowly leaving the international scene, despite Tontowi Ahmad trying to convince his partner to keep on crossing the world and its competitions a few more times. The legend has yet to actually designate a place where she will be stepping on court one last time, but it has been reported that it will certainly happen by the end of the year. She and Ahmad will finish the French Open one spot out of qualifying for the World Tour Finals but they have only one more tournament and it is quite likely they will not qualify for Guangzhou.